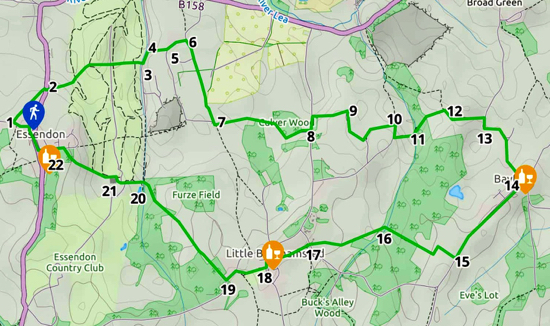 An undulating six and a half mile walk from Essendon eastwards to Howe Green then over to Bayford, south to Little Berkhamsted and back to Essendon. This walk involves crossing the golf course twice and includes a fair amount of up and down. Park in the village of Essendon either on Church Street near the church or down School Lane and walk west on West End Lane until you reach a footpath on the right just after the last house. Take this path and walk diagonally north, north-east across the field until you reach the B158, Essendon Hill. Cross the road and take the footpath opposite as it weaves over the golf course emerging on the other side via a footbridge and on to Bedwell Avenue. Turn left and walk north looking out for a footpath sign on your right. Take this path which heads east, climbs a hill and crosses a field. You emerge on country lane. Turn left and continue as the lane curves round to your right. At the next bend, just before it swings left, you will see a footpath sign on your right just after a house. Take this path. Continue across a couple of fields until you emerge at the top of a lane by a farm. 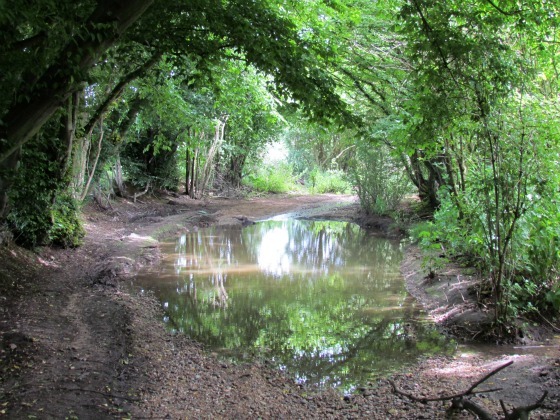 This is a dead end for the lane, but your way is straight ahead along a footpath which heads almost due south and climbs up to Little Berkhamsted. As soon as you start down this path, look out for a footpath on your left. This climbs over a hill and heads east through a site of scientific interest, dropping down to a gate leading to a private lane. Follow this lane round to the right with Culver Wood on your left until you reach the road. This is called Robins Nest Hill. Turn left and walk north for a short distance along the east side of the road taking care on the bend because there is no footpath. Look out for a footpath on your right heading east with the fields on your left. Continue along this path as it drops down to a quiet lane. Turn right and follow the lane round as it heads south until you meet a path on your left. Take this path and follow it until it meets another quiet lane near some houses. Here you turn right and continue south a short distance looking out for a footpath on the left. This path drops down to Bayford Wood with the field on your right and the hedgerow on your left. Enter Bayford Wood and cross a small footbridge, climbing the other side and heading north-east to reach a field. Follow the path through the field to the other side. Here you turn right and head south-east before the path bends to the east emerging on Bayford Lane. Here you turn right a short distance and follow the lane as it round to Bayford village. Unfortunately this part of the walk involves some busy lane walking. Some stretches don't have footpaths. Follow the path round until you reach the Baker Arms. Continue through Bayford village until you reach a footpath on your right. Take this path down through the fields and then into Bayford Woods. 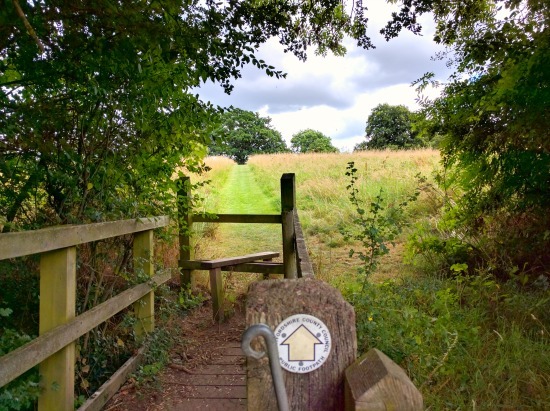 Cross the footbridge and turn left through the fields climbing your way up to Little Berkhamsted, emerging on a lane called Buck's Alley. Turn right and then look out for a footpath on your left leading over the fields to Little Berkhamsted village. Turn left in the village until you reach The Five Horseshoes. Look out for a footpath on your right running along the side of the village cricket ground. Take this path and continue with the cricket pitch on your left until you reach a gate. Here you turn right and walk north-west a short distance emerging on Little Berkhamsted Lane. Turn left looking out for a bridleway/lane on your right. Take this path and continue until it becomes a footpath dropping down through woodland as it heads north. When you reach a cottage on your left veer slightly left and head west across the golf course climbing until you reach the golf club buildings where you turn right and follow the path round as it bends first left and then continues west across the fairway eventually emerging on Essendon School Lane. Turn left and return to the village. If you need refreshments, the Rose & Crown is to your left a short way down the B158, Kentish Lane. Otherwise turn right on Kentish Lane and head back to where you parked the car.